Step 1: Log in to your account dashboard and proceed to edit your website. 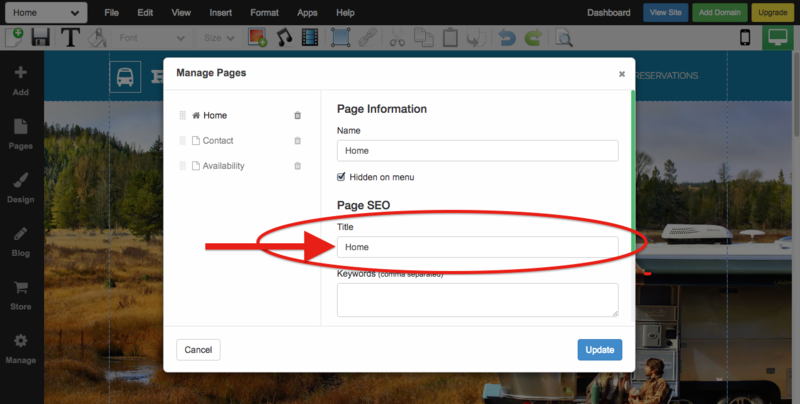 Step 2: Once you're in the website editor, click on the Pages icon on the left toolbar. Step 3: Click on the "Page Settings" cog icon next to the page you'd like to make the changes to. Step 4: On the Page Information screen that appears, scroll down under Page SEO and find the Page Title. Enter the new title for your page in the box below, then click Update. Once done, be sure to save your changes. Note: Be sure you're entering the new page title under "Title" and not 'Name" - Name is what will appear on the menu bar for that page name.